I borrowed my sister's exercise bike last week. I like this kind coz my hands are free to do stuff. So I've been multitasking...watching movies, knitting and exercising all at once. In the past four days I've clocked up 50kms and about four movies. 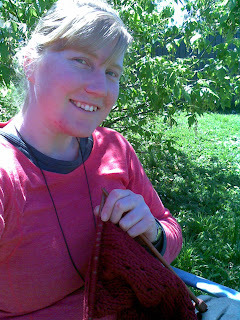 I also began knitting my first shrug as you can see. I also got the other Jeanan glove done too and they make a handsome pair. I'm really quite happy with the way they turned out. The sun was thoroughly enjoyed by all. 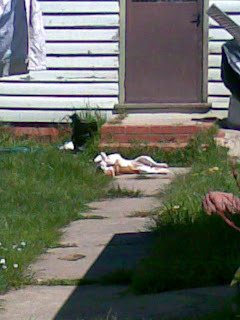 I looked up toward the house while relaxing and spotted my brother's dog sunbathing. Ha ha. 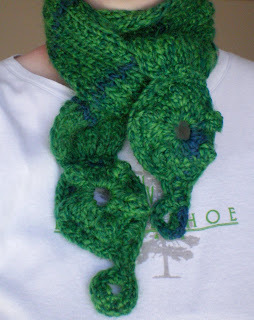 Oh, and I also got this scarf finished and listed in my online stores. (See store windows to the right. )It's knitted in accidental ribbing with crocheted paisley ends. Made out of Moda Vera Audrey so it's nice and thick and soft.